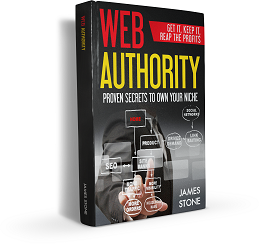 Web Authority by James Stone > Build a Business > What is Web Authority? ADVANCED ARTICLE MARKETING – That is what you are thinking my book is all about. Yes, it is, and so much more. Article marketing is just one component of the art of providing content to the world to attract traffic to your website. We are talking about free traffic to your website and only “White Hat’ marketing practices.” Coupled with a strategy that incorporates article writing for your blog, article writing for article marketing websites, syndication, and some simple secrets to writing an effective traffic grabbing article, you can achieve that proverbial golden ring in the sky for Internet marketers called an Authority Website within a surprisingly short period of time. Web Authority is the idea that, for your topic, and your niche, you own the majority of the free, organic search traffic available. Your site becomes the recognized authority on that subject. That means your site is recognized not just by loyal readers, but more importantly, by all the major search engines. By the time you finish reading this book, you will know exactly how, where, and what to do to achieve this valuable and effective goal. Wait a minute, why does this matter? Who cares if you are the authority site? What is all of this going to do for you? The answers affect your pocketbook. If you or your company is selling products or services on the Internet, you clearly want as much Internet traffic from the search engines as possible. The more visitors, the more chances you have of making a sale. The game of “Sales” is a game of numbers. More visitors equal more sales. What are you spending for that traffic, both in time and money? The article marketing game does not cost anything more than the time it takes to write the articles and to play the game. If you currently have an active Google Ad-words pay-per-click campaign going, you know how much paid advertising can cost. It can be staggering if you are not careful. Achieving Web Authority for your niche brings you targeted organic free leads. These are the kind of leads that some companies pay upwards of $100 each. It is worth doing, but even more than that, becoming the recognized expert in your industry or niche also brings trust from your prospects. These kinds of relationships with potential clients may take you months to cultivate in a traditional sales methodology. Why doesn’t everybody do this? Frankly, people do not like to write. I start my online webinars with this sentence “Really Doc, do I have to write stuff?” Yes, you do. The Internet after all is a collection of words and phrases. I understand how hard it is to write. When I wrote this book, I had most of it dictated and transcribed from my live webinars. This is one way of capturing original material for publication but there are so many other ways to get the content you want for next to nothing. We will cover that. For now, you can relax. If you hate to write, you will be pleasantly surprised to know you can get around most of it and still get great results. If you love to write, this will be fun for you. I do want to remind you though. The reason we’re writing is to provide search engines what they crave. Remember, the entire Internet is made up of nothing but words and some HTML code. Search engines cannot see pictures, they cannot get the gist of what you are trying to say, and they don’t comprehend ideas like humans. Search engines must index your pages in a split second but there are more websites than people on the planet. They do not have time. Search engines are searching for patterns. These patterns of words are called keyword phrases. There is a fine line between creating an article built for the search engines and an article that still makes sense and captivates a human. I will show you how to do both easily and with quality. The main reason most of us write articles is to attract website traffic and make a good living, but what we would really like is free website traffic from search engines. So for you writers out there, this will be fun. For the rest of us, we will concentrate on making this routine and purposeful.